This is a rare, pure white color form found in a single colony of off Highway 199 in Northern California that varies from pure white to the more familiar pink. The white (or albino) form seemed to all produce unusually large anthers, as can be seen in the photo. Discovered by Mr. Boyd Kline, the location of this colony is a closely guarded secret to protect it from plant collectors. Thinking about looking for it? Hwy 199 stretches from Grants Pass, Oregon to Crescent City, California and the fire road leading to its location is not for the faint of heart! If your vehicle does not have river crossing clearance or will not turn around in a width of less than 8 feet, or have "D8" stenciled on it, plan on backing down a loose gravel road approximately six miles, parts of which are so steep that your vehicle will not stop, but just continues to slide down the hill with gravel acting as marbles under your tires. Should you try to attempt it, don't take your wife, even Dianna refused to go saying "you go on, I will stay here and take my chances with the snakes". 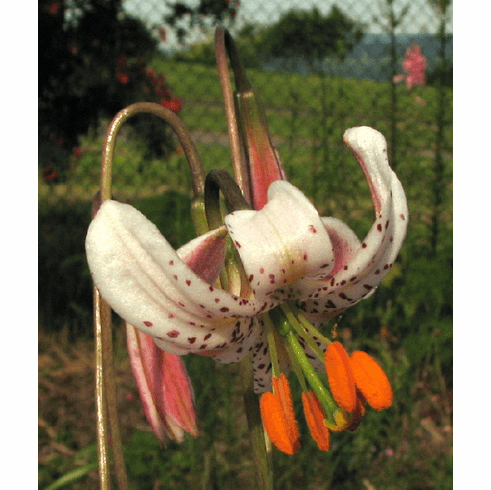 Title photo is from Gene Mirro in June of 2012 and it truly made our day in knowing this rare little lily was being grown in the garden. When we viewed the colony in the mid 80's, the flowers were in full bloom and there were no seed pods. We never returned to that colony not wanting to taunt serious injury or even death. Copyright Gene Mirro, all rights reserved. Used with permission. Thank you Gene for your diligence in growing this wonder of nature. Photo insert #1 is of plant specimen in wild colony. Photo inset #2 was taken at the nursery of Boyd Kline and is of a natural hybrid between his namesake white form and the more familiar pink form. Photo insert #3 is of an exceptionally fine stem of this variant grown by Gene Mirro. Copyright Gene Mirro, all rights reserved. Used with permission.